Packing down small and easy to inflate, Easy Camp Movie Seats are smart flexible designs adding a touch of luxury and fun on site. 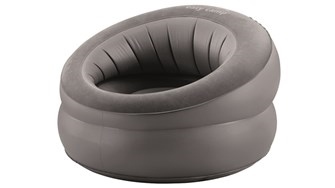 Really comfortable, they offer firm seating that is fast to inflate/deflate and pack away. Air furniture sees new inflatable designs for 2018 with the new Comfy Sofa, Comfy Lounger, Comfy Chair & Comfy Pouf. Love to lounge? Bring inside comfort outside with Easy Camp AIR FURNITURE. This range is for serious comfort seekers who want to sink into something special. There are sofas and loungers to stretch out on, armchairs to curl up in, and poufs to put your feet on - all with a super soft surface for the ultimate relaxation. Quick to inflate, the range is laidback fun at its best and packs down to a small size for easy storage. It’s ideal for festivals, campsites, or whenever you want to kick back. Comfy, did the job, just needs topping up daily! not a major issue, but when you only use it for eating breakfast and dinner it can become tedious. Other than that, it was decent! These are great chairs for kids and teens and small adults. If you are 6ft this is not the chair you are looking for. They are sturdy and comfortable and inflate quickly. Very comfy and not to big. Lovely for a camping break. Great price too! I recommend this product to whom goes to camping, it's great product.